"My research broadly addresses design thinking and human factors for challenges in healthcare with a focus on resilience and creativity in innovation for safety critical and distributed healthcare. My research aligns with healthcare system goals of enhancing the efficient delivery of healthcare, preventing iatrogenic events, and assisting patients and home caregivers to effectively manage home care. Addressing these goals necessitates a human centred approach to design and research, sensitivity to healthcare as a system, knowledge of emerging and current technology trends, and attention to potential barriers and facilitators to leading innovation and change." 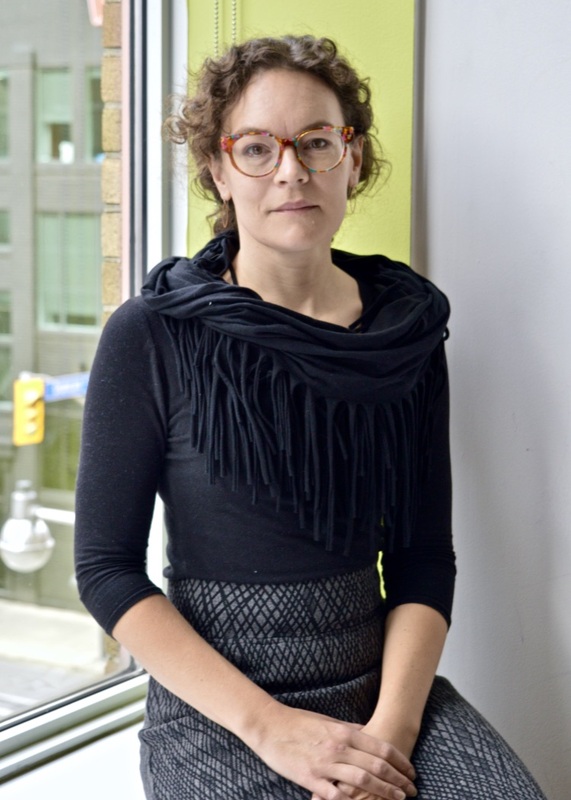 Dr. Kate Sellen is an Associate Professor in the Faculty of Design at OCAD U and a Tier 2 Canada Research Chair nominee. She is Director of the Health Design Studio and leads the Healthcare and Resilient Experience Research Group at OCAD U. While at OCAD Kate has served on several program committees as well as university-wide committees and initiatives and several hiring committees. Kate is the Director of the Health Design Master's Program. Kate spent her early career as an interaction designer leading design research, digital strategy, and interaction design in the private sector. She now works on bringing an inclusive and interdisciplinary design approach to healthcare design challenges. Much of her work focuses on design for patient safety in safety critical/high sensitivity topics, including the dosing, ordering, tapering and management of opiates, communication at end-of-life, and the issuing and delivery of blood units for surgery. She has previously held positions at the University of Toronto's Technology for Aging Gracefully Lab, Knowledge Media Design Institute, and AT&T. Kate Sellen has a Master's degree in Information Design from Georgia Institute of Technology, a Bachelor's of Science and Master of Research from University College London, and a PhD in Human Factors in Industrial Engineering from University of Toronto. 07/1999-03/2000 Interactive Researcher, Revolution Ltd.
Sellen K. (2017, June). Digital Health and Wellbeing. DesignMeets, MaRSD, Toronto, Canada. Invited. Sellen K. (2017, January). Role of design in synthesizing different kinds of truth about health and wellbeing, TODO Symposium: Design and the Pursuit of Wellbeing, Toronto, Canada. Sellen K. (2015, November). What can we learn from the introduction of Electronic Remote Blood Delivery?, Research Rendezvous, OCADU, Canada. Sellen K. (2015, November). Error and behavior with the introduction of Electronic Remote Blood Delivery, Faculty of Medicine, University of Toronto, Canada. Sellen K. (2015, November). Design Strategies for Health: interdisciplinary opportunity. Innovation Learning Network Safari, Toronto, Canada. Oikonen, K*., Sellen, K., and N. LeFebre (October, 2015). Understanding Distance: Geography vs the ability to “see” decline for family members at a distance during palliative care. In 2015 Canadian Hospice Palliative Care Conference, Ottawa. Sellen, K. (2015, October). Adaptation to New Technology in Safety Critical Transactional Processes: Electronic Remote Blood Issue. University College London, Interaction Group. October, 16, 2015, UCL, London. Sellen, K., & Hunt, R. (2014, April). Dynamic Typeface and Disambiguation. Computational Linguistics Research Group – C. Collins, April, 12, 2014, UOiT. Sellen, K., Hunt, R. & Van Alstyne, G. (2013, Dec). Safe Font Project. Design Meets Health, December, 17th, 2013. OCADU. Sellen, K., Hunt, R. & Van Alstyne, G. (2013, Nov). Safe Font Project. Research Rendezvous, November 24th, 2013. OCADU. Sellen, K., & Van Alstyne, G. (2012, May). Safe Font Project. Inclusive Design Institute Launch, May 24, 2012. Digital Display. Sellen, K. (2012, April). Information journeys and medication safety in long term care. Presentation at Design for Health Journeys. sLab Explorations. April 30, 2011, OCAD U.
Jovicic, A., Chignell, M., Straus, S., & Sellen, K. (2008, September). Teleconferencing and Web Support Programs for Patients with Congestive Heart Failure. Paper presented at the International Federation on Ageing 9th Global Conference on Ageing and Expo Ageing and Design, Sept 4-7, 2008, Montréal. (presented on behalf of first author). Sellen, K. (2008, May). New understandings of technology through design research. Presentation as part of a Seminar Series: Design Research: Views from Across the Disciplines., Knowledge Media Design Institute, May, 2008. Sellen, K. (2007, March). Determining Differences in User Preferences and Strategies: Functional Cloud Technique. Presentation as part of the Research Seminar Series, Knowledge Media Design Institute, March, 2007. Sellen, K. (2002, March). E-government, XML and User Interface Design. Presentation as part of an external speaker seminar series, Program in Information Design & Technology (now Digital Media), Georgia Institute of Technology, March, 2002. Sellen, K. & Kehoe, C. (1999, May). 10 Annual GVU Web Survey Results, Georgia Institute of Technology, May, 1999. Singh, A., Newhouse, N., Gibbs, J., Blandford, A., Chen, Y., Briggs, P., Mentis, H., Sellen, K., Bardram, J. ( - 2017). HCI and Health: Learning form Interdisciplinary Interactions. Special Interest Panel. In Proceedings of the International Conference on Human Factors in Computing Systems (Toronto, Canada, May 6-12, 2017). CHI '17. ACM, New York, NY. Seeschaaf-Veres, A., Sellen, K., MacIntyre, N. (May, 2016). Intersections in DIY Health and Designer roles in co-customization for Health. In workshop proceedings, Advances in DIY Health and Wellbeing. Workshop. International Conference on Human Factors in Computing Systems (San Jose, USA, May 5 – May 8, 2016). CHI '16. ACM, New York, NY. Sellen, K. & Chignel, M. (April, 2014). Pace and Temporality in Safety Critical Medical Work: Concepts for Understanding Adaptation Behaviors. In workshop proceedings, HCI Research in Healthcare: Using Theory from Evidence to Practice. Workshop. International Conference on Human Factors in Computing Systems (Toronto, Canada, April 26 – May 1, 2014). CHI '14. ACM, New York, NY. Norman, C., & Vink, J. *, Hunyh, T.*, Kachur, O. *, Sellen, K. (April, 2014). Co-creating Community Wellbeing with the Sandbox Model: Facilitating Empathic Engagements. In workshop proceedings, Enabling Empathy in Health & Care: Design Methods & Challenges. Workshop. International Conference on Human Factors in Computing Systems (Toronto, Canada, April 26 – May 1, 2014). CHI '14. ACM, New York, NY. Crosskey, S.*, Dang, Y. * & Sellen, K. (April, 2014). Storytelling and Generative Tools with Older Adults with Memory Loss. In workshop, Participatory Design with people with cognitive or sensory impairments. Workshop. International Conference on Human Factors in Computing Systems (Toronto, Canada, April 26 – May 1, 2014). CHI '14. ACM, New York, NY. Sellen K., Hunt, R. & Van Alstyne, G. (February, 2014). From Legibility to Disambiguation: Typographic Design Strategies to Prevent Misreading. Poster at HFES 2014 Symposium on Human Factors and Ergonomics in Health Care: Leading the Way, March 16-19, Chicago, USA. Human Factors and Ergonomics Society, Santa Monica, CA, USA. Sellen, K., Furniss, D., Chen, Y., Taneva, S., O’Kane, A., & Blandford, A. (2014). HCI Research in Healthcare: Using Theory from Evidence to Practice. Workshop proposal. In Proceedings of the International Conference on Human Factors in Computing Systems (Toronto, Canada, April 26 – May 1, 2014). CHI '14. ACM, New York, NY. Sellen, K., Chignell M., Kealey, R. & Canella, D. (2013). Exploring a Distributed Cognition Approach to Supporting Medical Calculations: A Design Strategy. Workshop on MediCHI: Safer Interaction in Medical Devices. In Proceedings of the International Conference on Human Factors in Computing Systems (Paris, France, April 27 – May 2, 2013). CHI '13. ACM, New York, NY. Baecker, R., & Sellen, K. (2013). Design for a diversity of Physical, Cognitive, Emotional, and Spatial Family Challenges. Workshop on Exploring the Diversity of Families: Designing Technologies for the Contemporary Family Life. In Proceedings of the International Conference on Human Factors in Computing Systems (Paris, France, April 27 – May 2, 2013). CHI '13. ACM, New York, NY. Sellen K, Callum, J., Chignell M, Pendergrast, J. & Halliday, A. (2013). Negotiating Capture, Resistance, Errors, and Identity: Confessions from the operating suite. Workshop on HCI Fieldwork in Healthcare – Creating a Guidebook. In Proceedings of the International Conference on Human Factors in Computing Systems, (Paris, France, April 27 – May 2, 2013). CHI '13. ACM, New York, NY. Sellen, K., Jovanovic, A. *, & Chignell, M. (2012). Exploring Qualitative Analysis Techniques To Identify Opportunities For Error: The Case Of Electronic Remote Blood Delivery. In Proceedings 2012 Annual Symposium of the American Medical Informatics Association, November 3-7, 2012, Chicago, IL, USA. Kachur, O. *, Sellen, K., Rodin, G. & Rutgers, J. (2012). Challenging contexts: Hearing the voice of residents and families in hospice care design research. In CHI 2012 Workshop "Memento Mori: Technology Design for the End of Life." In Proceedings of the International Conference on Human Factors in Computing Systems, May 05 - 10, 2012, Austin Texas, USA, ACM, New York, NY. Sellen, K., Callum, J., Chignell, M., Straus, S., Pendergrast, J. & Halliday, A. (2011). Does Technology Acceptance Determine Attitude Towards Health Information Technology? The case of Electronic Remote Blood Delivery. In Proceedings of the 2011 Annual Symposium of the American Medical Informatics Association, Workshop on Interactive Systems in Healthcare, October, 2011, Washington DC, USA, ACM, New York, NY. Sellen, K., Chignell , M., Straus, S., Callum, J., Pendergrast, J. & Halliday, A. (2010). The Emergence of Errors with the Implementation of Electronic Blood Delivery to Operating Rooms. In Proceedings of the 2010 Annual Symposium of the American Medical Informatics Association, November 13-17, 2010, Washington DC, USA. Sellen, K., Chignell, M., Straus, S., Callum, J., Pendergrast, J. & Halliday, A. (2010). Using Motion Sensing to Study Human Computer Interaction in Hospital Settings. In Proceedings of Measuring Behavior 2010, Eindhoven, The Netherlands, August 24-27, 2010. Eds. A.J. Spink, F. Grieco, O.E. Krips, L.W.S. Loijens, L.P.J.J. Noldus, and P.H. Zimmerman. (pp. 297- 230). Witteman, H., Whyte, S., Bender, J., Janutka, M., Sutton, E., O'Grady, L., Sellen, K., Von Tunzelmann, M., Prior, C., Enkin, M., Borgerson, K. & Wathen, N. (2009) Apomediation and Women's Choices of Birth Place and Attendants. Medicine 2.0, Sept 17-18, 2009, Toronto, Canada. Sellen, K. M., Massimi, M. A., Lottridge, D. M., Truong, K. N., & Bittle, S. A. (2009). The people-prototype problem: understanding the interaction between prototype format and user group. In Proceedings of the 27th international conference on Human factors in computing systems (pp. 635-638). ACM. Callum, J.L., Halliday, A., Merkley, L., Colavecchia, C., Leeksma, A., Sellen, K., Pendergrast, J., Karkouti, K., Cserti, C. & LaFlamme, C. (2008). Remote release of red blood cells by electronic crossmatch in the operating room at a large, academic trauma center: improving the speed of blood delivery while decreasing workload. AABB 2008 Annual Meeting, October 4 - 7, 2008, Montréal, Québec, Canada. Lottridge, D.M., Sellen, K., Smith, K.L., Bittle, S., & Casselman, M. (2007). User-centred design of a web-based tool for locally relevant information sharing for new mothers. e-Health conference, May 27-30, 2007, Quebec City, PQ. Sellen K, Sarcevic A, Randell R, Chan D, Zhou X, Rajkomar,A, Chen Y, (2014). Data Collection and Healthcare Fieldwork. In HCI Fieldwork in Healthcare – a guidebook. Eds. Furniss, D., O’Kane, A., Randell, R., Taneva, S., Mentis, H. & Blandford, A., part of Synthesis Lectures on Assistive, Rehabilitative, and Health-Preserving Technologies. Series Ed. Baecker, R., Morgan & Claypool Publishers. Sellen K, Callum, J., Chignell M, Pendergrast, J. & Halliday, A. (2014). Negotiating Capture, Resistance, Errors, and Identity: Confessions from the operating suite. In HCI Fieldwork in Healthcare Case Studies. Eds. Furniss, D., O’Kane, A., Randell, R., Taneva, S., Mentis, H. & Blandford, A., part of Synthesis Lectures on Assistive, Rehabilitative, and Health-Preserving Technologies. Series Ed. Baecker, R., Morgan & Claypool Publishers. Sellen, K., & Senders, J. (in press) Handwriting and Medical Error. In Human Error in Medicine, Ed. Sue Bogner. 2nd Edition. Taylor & Francis -. Sellen, K. and Witek, T. (Dec 2017) Designing Health. MISC Journal of Strategic Insight and Foresight, p124-125, vol 28. Rehman, S.*, Lyons, K., Sellen, K., McEwan, R. (2017). Sharing illness experiences on Twitter: conversations of parents of children diagnosed with cancer. Information, Communication and Society -. Neidzelski, O. *, Rodin, G., Emmerson, D., Rutgers, J., Sellen, K. (January, 2016) Exploring Sensory Experiences and Personalization in an Inpatient Residential Hospice Setting. Journal of Hospice and Palliative Medicine, -. Sellen, K., Jovanovic, A., Chignell, M., Perrier, L. (2015) Systematic Review of Electronic Remote Blood Issue. Vox Sanguinus, 109(1):35-43. Sellen K, Sees-chaaf-Veres A, Chau W, Kerr H, (accepted) Collaborative Engagement to Reduce Deaths From Opiate Overdose. In Proceedings: Engineering and Product Design Education, September 6-9, 2018, London, UK, pp 1-6 , -. Sellen, K., (invited and accepted) Knowledge Integration in Health Design. In special issue: Design & Technology Education, Design and Technology Association, pp 1-10, -. Sellen, K., (2017) Problem Based Learning: Developing Competency in Knowledge Integration in Health Design. In Proceedings: Engineering and Product Design Education, September 7-8, 2017, Oslo, Norway, pp 1-6. Sellen, K., (2016) Including the Dynamics and Temporal Aspects of Work for Human Centered Design. In System/software development and Quality (pages 1-10). HCI International 2016, Springer International Publishing. Charbonneau, R.*, Sees-chaaf-Veres, A., Sellen, K., (2016) Exploring Downloadable Assistive Technologies through the Co-Fabrication of a 3D Printed Do-It-Yourself (DIY) Dog Wheelchair. In Universal Access in Human-Computer Interaction (pages 1-10).. HCI International 2016, Springer International Publishing. Boscart, V., Spence, M., Campigotto, R., Sellen, K., Baecker, R., (submitted January 2016) Social Isolation, Loneliness and Communication Needs of Older Patients in Complex Care Settings. Research in Ageing, -. Baecker, R., Sellen, K., Crosskey, S.*, Boscart, V., & Barbosa Neves, B., (October, 2014) Technology to reduce social isolation and loneliness. Proceedings of the 16th International ACM SIGACCESS Conference on Computers and Accessibility. ACM, New York, NY, USA. (full paper). Kennedy, A. G., Senders, J. W., Sellen, K., Littenberg, B., Callas, P. W., & Carney, J. K. (2009). Perception of drug-name legibility by pharmacists and pharmacy technicians. American Journal of Health-System Pharmacy, 66(9), 794-795. Sellen, K. and MacLachlan, T.* (2016) Report to HiNext Litd. on the usability and design of TREAT – mental health electronic health record, 1-14. Sellen, K., Callum, J., Chignell, M., Straus, S., Pendergrast, J., Halliday, A., Jovanovic, A. (2012). Report to Haemonetics Ltd on the Usability and Redesign of Blood Track Courier Remote Blood Delivery System, 1-36. Sellen, K. and Senders, J. (2006). Drug Name Similarity, Handwriting and Medication Error. Report to the Pharmaceutical Manufacturers Association of America, 1-69.